Demand for aseptic packaging in the US is projected to rise 6.8 percent annually to $6.4 billion in 2020. Gains will be driven by advantages in processing and ambient temperature storage. Prefillable syringes and plastic bottles will be the fastest growing products, with syringes replacing bottles as the largest segment. Beverages will be the fastest growing market. 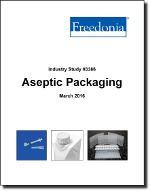 This study analyzes the $4.6 billion US aseptic packaging market. It presents historical demand data (2005, 2010 and 2015) and forecasts (2020 and 2025) by product (e.g., plastic bottles, prefillable syringes, vials and ampuls, bags and pouches, cartons, cups, glass bottles) and market (e.g., pharmaceuticals, beverages, food). The study also considers market environment factors, details industry structure, evaluates company market share, and profiles 36 industry competitors, including Tetra Pak, Becton Dickinson, and West Pharmaceutical Services.